Julie Dawkins Family: Yummy kid friendly dessert! 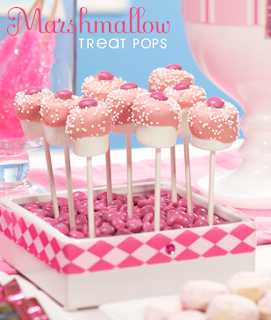 Marshmallow Pops! I found this EASY dessert today on a blog called Hostess Blog. Way cute idea! It makes me wish that we could still home make Halloween candy. These would be great to hand out. I guess I can modify them for Savvy's first birthday party. I'm not sure I can do the all pink thing since there will be little boys invited. I might have to make them more fall themed since we are having a hay ride/bonfire out at the Ranch. Step four: Pop in Mouth and Enjoy.